As Monet-Superhuman strength, speed, agility, dexterity, reflexes, coordination, balance, vision, hearing, and endurance, Genius level intellect, Accelerated healing factor, Flight and Telepathy. The twins and their siblings also have the ability to merge into different forms with powers a combination of them. Born to a mother of royal Algerian lineage and a wealthy Afro-European ambassador Cartier St. Croix. They were the favorite children of their mother. Claudette was the autistic child and no treatment seemed to help. Nicole meanwhile was full of energy and life. Their family came undone when their mother mysteriously disappeared and their brother was expelled from their home. One day while home with Monet they stumbled into her room and found brother Marius and a strange red skinned creature. Outraged Claudette used her powers to cast him into another dimension and the red creature followed. Nicole knew their father would have been devastated and thus devised a plan to merge with Claudette and impersonate Monet (Generation-X #40). The ruse was almost perfect but each twin spent equal time in control of the body thus ‘Monet’ would be struck immobile when Claudette was in control. There apparently was an adjustment period because for three months she uttered not a single word despite all outside stimuli. While out with Gaye one day the Phalanx abducted them (Uncanny X-men #316). While captured alongside Blink, Husk, Skin and Gregore she remained in her autistic fugue. Once Nicole regained control though she busted the teens out and destroyed Gregore who was a phalanx in disguise (Uncanny X-men #317). They managed to escape but lost Blink thanks to the X-man Banshee, Emma Frost, Jubilee and Synch (X-men #37). 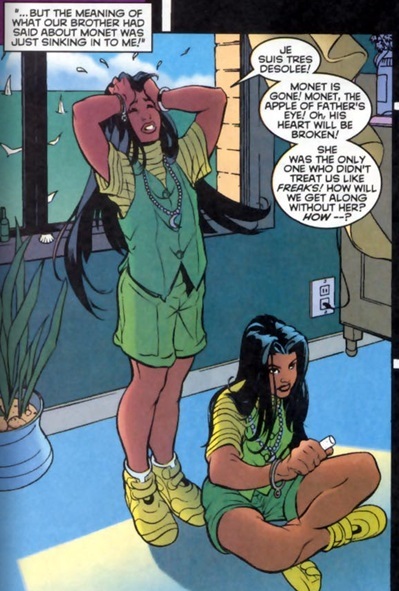 Masquerading as Monet the twins joined Generation-X while secretly being taught by the aboriginal mutant Gateway. He also let them know that Emplate had returned and would attack Chamber. This allowed them to stop the attack though their brother escaped (Generation-X #1). They eventually freed their sister and were trapped in her prison before an attack from Emplate freed them as well. They shared a reunion with their father who took them away from the school. They have not been seen since and are assumed to be living with father Cartier.